The ability of the Chagas disease agent Trypanosoma cruzi to resist extended in vivo exposure to highly effective trypanocidal compounds prompted us to explore the potential for dormancy and its contribution to failed drug treatments in this infection. We document the development of non-proliferating intracellular amastigotes in vivo and in vitro in the absence of drug treatment. Non-proliferative amastigotes ultimately converted to trypomastigotes and established infections in new host cells. Most significantly, dormant amastigotes were uniquely resistant to extended drug treatment in vivo and in vitro and could re-establish a flourishing infection after as many as 30 days of drug exposure. These results demonstrate a dormancy state in T. cruzi that accounts for the failure of highly cytotoxic compounds to completely resolve the infection. The ability of T. cruzi to establish dormancy throws into question current methods for identifying curative drugs but also suggests alternative therapeutic approaches. Chagas disease is one of the most harmful tropical diseases in the Americas. It affects millions of people, predominantly in Latin America. It is usually spread by kissing bugs infected with Trypanosoma cruzi parasites. It is considered a neglected tropical disease because few effective treatments and preventive methods are routinely used. Several drugs can kill T. cruzi parasites, but they often fail to cure the infection. Many people with Chagas disease go on to have life-long infections and eventually develop heart failure. The reason for the high rate of treatment failure is not known. It does not appear to be the result of the parasites developing resistance to the drugs. One possibility is that the parasites can hide in a dormant state in the body, dodging the toxic drugs and living to reproduce another day. Now, Sánchez-Valdéz et al. identify a dormant form of the T. cruzi parasite that allows the infection to persist after treatment. In the experiments, a non-reproducing form of the so-called amastigote stage of the T. cruzi parasite inside the host cells was observed in infected mice and human cells. While some of the amastigote parasites continue multiplying, a few stop even without drug treatment – but can resume multiplication at a later time. They may also be able to change into the trypomastigote form of the parasite, which can infect new cells. These non-multiplying amastigotes can survive drug treatment for as long as 30 days, whereas the multiplying amastigotes are killed by such drugs. However, the surviving amastigotes then reestablish active infections after treatment has stopped. The experiments explain why treatment so often fails to cure Chagas disease. This suggests new treatment strategies are needed, including using existing drugs for a longer time perhaps with less frequent doses. New therapies that kill the dormant amastigotes may also help. Treatments that overcome the parasite’s ability to hide, could stop the progression of the disease and prevent heart-related deaths in those with persistent T. cruzi infections. Parasitic diseases have been particularly resistant to the development of effective vaccines and safe and curative therapeutic drugs. The drugs that have been put into use often suffer from one or more of the problems of inefficiency, high toxicity and/or selection of drug resistant mutants. Despite being one of the highest impact infectious diseases in the Americas, T. cruzi infection in humans is relatively rarely treated. Initially this was because of the misconception that Chagas disease had an autoimmune, rather than pathogen persistence etiology (Tarleton, 2003) but more recently the substantial toxic side effects and the limited supply of benznidazole (BZN) and nifurtimox (NFX), drugs that have been in use for decades, has also contributed significantly to their low rate of utilization. However, the highly variable outcome of treatment regimens employing these compounds – ranging from 0% to 100% depending on the study - and the difficulty of accurately assessing these outcomes, also keep utilization as low as 1% of those infected (de Castro et al., 2006; Guedes et al., 2011; Jackson et al., 2010; Navarro et al., 2012; Yun et al., 2009). The reason for the high variability in the efficacy of BZN and NFX is not known but has been primarily attributed to the broad genetic diversity of T. cruzi isolates. Importantly, the lack of drug efficacy is almost certainly not a result of selection of genetic resistance by drug use or misuse, as neither BZN nor NFX have been widely or indiscriminately used and the induction of stable resistance to these drugs is difficult to produce in vitro or in vivo. Further, the variable and often low contribution of humans to infection of insect vectors (many infections in insects originate from feeding on non-human mammals, within which T. cruzi circulates widely and at high levels [Cohen and Gürtler, 2001]), offers very few opportunities to drive and spread resistance even if it were to develop. In addition to classical genetic-based drug resistance, it has become increasingly appreciated that in bacterial infections, ‘persister’ cells develop that are transiently unaffected by chemotherapy, due in most cases to metabolic dormancy (reviewed in [Harms et al., 2016]). Such persisters can arise spontaneously in the presence or absence of stress signals and can reemerge after the termination of environmental challenges – such as antibiotic treatment. In this study, we document the occurrence of dormancy in the protozoan T. cruzi and link this phenomenon to the resistance of this parasite to otherwise highly effective and cytotoxic drugs. We show that both in vitro and in vivo, T. cruzi exhibits a biphasic kill curve, with the rapid death of most parasites but the persistence of transiently non-replicating intracellular parasites that are resistant to high level and prolonged drug exposure. The anti-T. cruzi drugs BZN and NFX are normally dosed in animals (including humans) for 30–60 days, although shorter treatment times can occasionally be curative (Bustamante et al., 2014; Viotti et al., 2011). This general requirement for a long treatment course and the variability in outcome is inconsistent with the documented rapid trypanocidal activity of BNZ for T. cruzi in vitro (Moraes et al., 2014), although to our knowledge, kill rates had not previously been determined in vivo. To directly assess the activity of BNZ in vivo, we first established a localized infection of T. cruzi in the footpads of mice and then used a transgenic luciferase reporter to monitor the loss of parasites subsequent to a single oral dose of BNZ. We first determined that T. cruzi trypomastigotes delivered in the footpad or skin, primarily infect host cells at the infection site (rather than distributing systemically) and expand as amastigotes within these host cells during the subsequent ~96 hr (Padilla, et al., in preparation). Administration of a single oral dose of BZN reduced intracellular amastigotes at the initial infection site by ~90% within 48 hr (Figure 1A–C). A similarly rapid reduction in parasite load occurs in mice with established systemic infections within a few days after the initiation of oral BZN treatment (Figure 1D–F). In this later experiment we used multiple T. cruzi isolates, including two (colombiana and ARC-0704) previously determined to be relatively more resistant to BZN in vivo (Bustamante et al., 2014). The rate of parasite clearance, approaching the limit of detection by imaging, was similar for all three strains and in the case of the colombiana infection, the 5 days of treatment resulted in a > 3 log10 reduction in systemic parasite load. Thus, consistent with previous in vitro assessments, BZN rapidly and highly effectively kills both ‘resistant’ and ‘susceptible’ T. cruzi strains in vivo. Rapid decrease of parasite load following short-term BZN treatment. (A) Schematic experimental protocol. C57BL/6 mice were infected in the hind footpads with 2 × 105 luciferase-expressing T. cruzi trypomastigotes of the CL-3 strain. A single oral dose of BZN (100 mg/kg) was administered 2 days post-infection. Cohorts of mice were maintained as untreated controls. Parasite bioluminescence following D-luciferin injection was measured at 6, 12, 18, 24 and 48 hr after BZN dosing. (B) Representative images showing footpad bioluminescent signal 2 days post-infection and at 6, 12 and 48 hr post-treatment. The heat map is on a log10 scale and indicates the intensity of bioluminescence from low (blue) to high (red). (C) Quantification of footpad signal. Each data point represents the mean of 12 footpads bioluminescence from six mice expressed on a logarithmic scale. After subtraction of the background signal, total flux measurements of photons per second (p/s) were quantified. A statistically significant difference (p=0.004) was found between treated (blue) and untreated (red) groups. (D) Protocol to measure systemic parasite load by bioluminescence before and during daily dosing with BZN. Cohorts of six SKH-1/B6 (hairless C57BL/6) mice were infected i.p. with 5 × 105 colombiana, ARC-0704 or CL-3 luciferase-expressing T. cruzi isolates. Oral BZN-treatment (100 mg/kg/day) was initiated on day 12 and continued until day 17 post-infection. (E) Dorsal (D) and ventral (V) images of individual representative infected mice. (F) Quantification of whole animal ventral bioluminescence. Dashed line indicates detection threshold determined as the mean plus two standard deviation of background bioluminescence of uninfected mice. Untreated control animals infected with all the strains showed similar high parasite levels, representative images (E) and data (F) for the group infected with colombiana strain are shown. No statistical differences were observed in the rate of parasite decrease between strains (p=0.29). Results are representative of three independent experiments with six infected animals per parasite strain group. While these experiments demonstrate that BZN treatment rapidly reduces T. cruzi numbers by 10- to 1000-fold over just a few days, we know from previous studies that such short-term treatments, and indeed treatments as long as 60 days, often fail to completely clear T. cruzi infection (Bustamante et al., 2014). This disconnect implicates a mechanism by which T. cruzi can resist highly effective trypanocidal drugs for an extended period of time. To investigate whether dormant/non-replicating forms of T. cruzi might be present in infected hosts and possibly contributing to this requirement for long treatment regimens, we used in situ labeling with nucleotide analog 5-ethynyl-2’-deoxyuridine (EdU) to determine the replication status of parasites within tissues of infected mice. We first established the in vivo EdU labeling protocol in acutely infected mice with high tissue parasite load, finding that the vast majority of amastigotes incorporated EdU during a 24 hr period after EdU injection (Figure 2—figure supplement 1). We then applied this protocol to mice with established chronic T. cruzi infections and again found that most intracellular amastigotes incorporated EdU over the 24–72 hr of exposure. However a small fraction of intracellular amastigotes failed to show evidence of replication over the 72 hr after EdU injection (Figure 2—figure supplement 2). Interestingly, these apparently non-replicating amastigotes were within host cells in which the other amastigotes were clearly replicating, suggesting that there is a heterogeneity of amastigotes in infected cells. Since the low parasite load in chronically infected mice makes it highly unlikely that a single host cell is infected by more than one trypomastigote, this heterogeneity in replication appears to establish within host cells from a single infecting parasite Figure 2. Rare amastigotes fail to incorporate EdU in chronically infected mice. (A) Experimental protocol for assessing proliferation of amastigotes in established in vivo infections. C57BL/6 mice were infected with 2.5 × 105 trypomastigotes of colombiana T. cruzi strain co-expressing fluorescent (Tdtomato) and luminescent (luciferase) reporter proteins. Sixty days post-infection, mice were injected i.p. with EdU and sacrificed 24, 48 or 72 hr after injection. Mice were perfused with PBS and luciferin and ex vivo bioluminescence imaging of selected tissues were performed to identify parasite foci. Luciferase-positive thick tissue sections were clarified and Tdtomato + parasites and EdU incorporation was detected by confocal microscopy. Colocalization of Tdtomato (red) and EdU (green) positive signals identifies proliferating amastigotes (yellow nuclei) from (B) skeletal and (C) adipose tissue. Arrows indicate rare red only (non-proliferating) amastigotes. Scale bars, 5 μm. 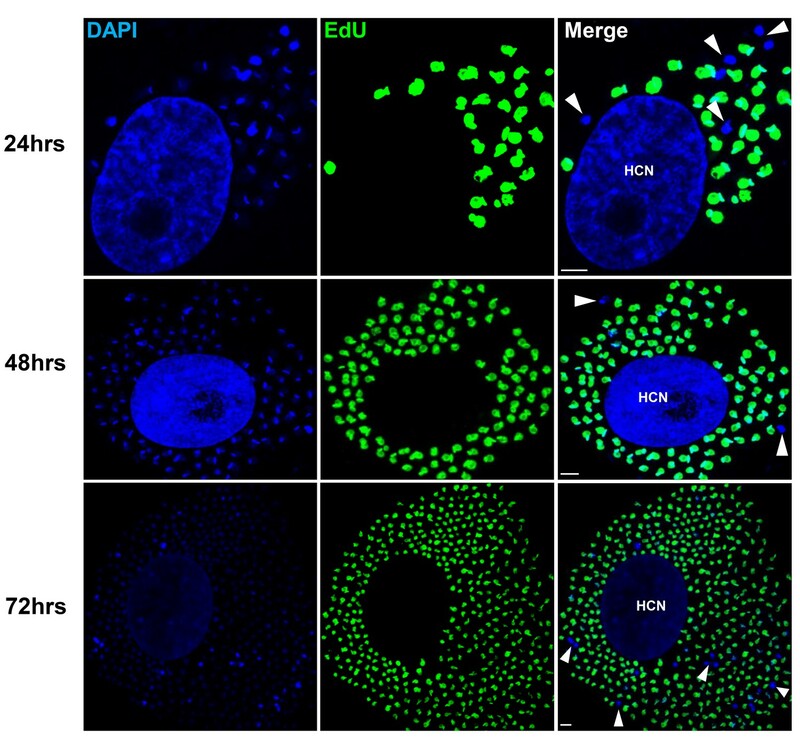 HCN = EdU positive host cell nuclei. Results are representative of three independent experiments using groups of 2–3 mice. To examine in greater detail the replication pattern of T. cruzi in host cells, we moved to in vitro systems wherein large numbers of infected cells can be readily monitored longitudinally during infection and the continuous exposure to EdU can be assured. As in the in vivo infection, a small fraction of amastigotes in host cells in vitro consistently failed to take up EdU, even when exposed for up to 72 hr of the ~96 hr intracellular replication phase (Figure 3). One possible reason for the failure to replicate is that some amastigotes might die within host cells (perhaps as a result of lethal damage to DNA, defective cytokinesis, or unequal dispersal of chromosomes/organelles during prior replication, among other possible reasons). However monitoring for apoptosis of amastigotes in host cells revealed this process to be extremely rare (Figure 3—figure supplement 1). Non-replicating amastigotes are also evident in vitro. Nearly confluent monolayers of Vero cells were infected with trypomastigotes of colombiana, CL, Brazil or ARC-0704 T. cruzi strain. Twelve hours after infection, cultures were washed and incubated with EdU (100 µM) diluted in fresh RPMI medium. EdU was detected after an additional 24, 48 or 72 hr culture period. DAPI staining (blue) allows the identification of EdU-negative amastigotes (arrows) from the EdU-positive (green). HCN, host cell nuclei. Scale bars, 5 μm. Results are representative of three independent experiments. Incorporation of EdU into DNA can impact DNA replication and thus cell division (Zhao et al., 2013). To rule out a role for EdU itself in inhibition of parasite replication, we used the cell division tracker dyes carboxyfluorescein succinimidyl ester (CFSE) and CellTrace Violet as a second method to monitor parasite replication in host cells. Both dyes couple to cellular components and are equally distributed to daughter cells during cytokinesis and with vigorous replication, the dyes are eventually diluted beyond the point of detection. T. cruzi trypomastigotes uniformly stain with either dye and upon infection of host cells, replicating amastigotes dilute the dye, while a fraction of amastigotes remain dye positive, indicating again the limited replication of a subset of amastigotes (Figure 4A and B). Amastigotes remaining dye positive after 72–96 hr were also EdU-negative (Figure 4C). Non-proliferating amastigotes can transition to trypomastigotes. 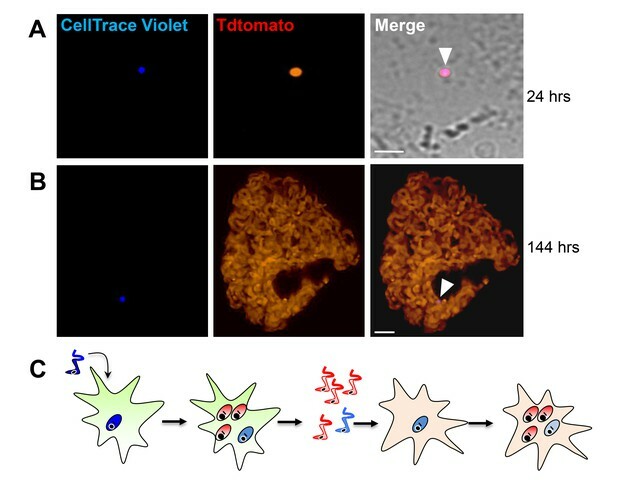 (A, B) Td-tomato expressing T. cruzi trypomastigotes were labeled with CellTrace Violet and used to infect Vero cells. Amastigote replication was monitored for 72–96 hr post-infection by live imaging (A) and confocal microscopy (B). Note the violet signal dilution in proliferating amastigotes and the retention of the dye in the non-replicating amastigote (arrows). (C) Vero cell cultures infected with CellTrace Violet-labeled T. cruzi trypomastigotes were incubated with EdU (100 µM) for 72 hr before fixation and detection of EdU incorporation. CellTrace Violet-positive amastigotes were also EdU-negative (arrow). Experiment was performed three times. (D) Schematic of the experimental protocol. T. cruzi colombiana strain trypomastigotes expressing Tdtomato were used to infect nearly confluent monolayers of Vero cells. Twelve hours after infection, the dishes were washed and incubated with EdU (100 µM) for 72 hr. Cultures were fixed, permeabilized and EdU (green) detection was performed just prior to trypomastigote release from host cells (~96 hr post-infection). (E) Arrowheads indicate EdU-negative trypomastigotes (red only) within host cells filled with EdU-positive trypomastigotes (green). (F, G) Violet-labeled Td-tomato-expressing trypomastigotes (colombiana or CL strains) were used to infect Vero cell cultures. Trypomastigotes released 92 hr post-infection were harvested by centrifugation and flow-imaged by ImageStream and sorted via fluorescence-activated flow sorting. Only a small subpopulation of trypomastigotes retained substantial CellTrace Violet after a single round of host cell infection. Similar results were obtained with CFSE staining of trypomastigotes (not shown). Scale bars, 5 μm. Experiment was performed a minimum of three times. By continuing to monitor infected host cells over time, we observed that amastigotes that had failed to incorporate EdU during the final ~72 hr in host cells were fully competent to convert to trypomastigotes and to exit host cells, along with the previously replicating (EdU+) trypomastigotes (Figure 4D,E). The use of the CellTrace Violet to mark parasites that had undergone a limited number or no divisions during the infection cycle in host cells allowed us to further characterize and ultimately isolate this minority population of trypomastigotes from infected cell cultures (Figure 4F and G), and to assess their ability to establish a second round of infection/replication in new host cells. Not only could trypomastigotes from minimally replicating amastigotes infect new host cells, re-convert to amastigotes (Figure 5A), and begin a new round of replication, but progeny of this replication can also stop dividing soon after invasion and retain dye for >6 days while other progeny of this dormant amastigote divided extensively (Figure 5B). Thus, a small proportion of T. cruzi amastigotes halt replication within 24 hr after host cell entry but can convert to trypomastigotes that are infection-competent and able to repeat the processes of replication and arrested replication in new host cells (Figure 5C). Trypomastigotes originating from non-replicative amastigotes are able to infect host cells and produce both replicating and dormant progeny. (A) Violet-positive trypomastigotes obtained as shown in Figure 4G were used to infect a fresh culture of Vero cells. Infected cells with CellTrace Violet-positive amastigotes were observed 24 hr post-infection (arrow). (B) Six days post-infection, a non-dividing CellTrace Violet-positive progeny was identified (arrow) in cells filled with dye-negative trypomastigotes. (C) Experiment summary: CellTrace Violet-positive trypomastigotes can produce both dormant (violet+) and actively replicating (violet-) progeny, both of which can convert to trypomastigotes. The trypomastigotes from previously dormant amastigotes can infect new host cells and repeat the process of generating both dormant and actively replicating progeny. Scale bars, 5 um. Experiments repeated twice. The detection of a small subpopulation of T. cruzi amastigotes undergoing minimal replication through 2 rounds of host cell invasion suggests that the cessation of replication can at a minimum happen early after host cell invasion, but did not preclude a more dynamic pattern of transitioning between replication and dormancy during the infection cycle in host cells. In order to better understand the flexibility and heterogeneity of replication within host cells, we monitored the early replication of T. cruzi in host cells by time-lapse video, using violet dye dilution to help mark those parasites undergoing minimal cell division within the same cell where other parasites are actively dividing (Sup Videos 1 and 2).These videos also indicate other characteristics of non-dividing amastigotes that were apparent in other still images, for example that non-dividing amastigotes are similar in size to recently divided amastigotes and are generally Tdtomato-dim, expressing low levels of the Tdtomato fluorescent protein relative to rapidly dividing amastigotes. Time lapse video of early stage intracellular replication of T. cruzi amastigotes. Cultures of HFF cells in 96 well glass bottom plates were infected with Tdtomato-expressing Cell Trace Violet labeled trypomastigotes in a ratio of 10:1 (parasites: host cells). After a5hrincubation, cultures were washed to remove extracellular parasites and imaged every 15 min for 48hr. Time lapse videos were generated spanning from 15:45 to 31:30hr. 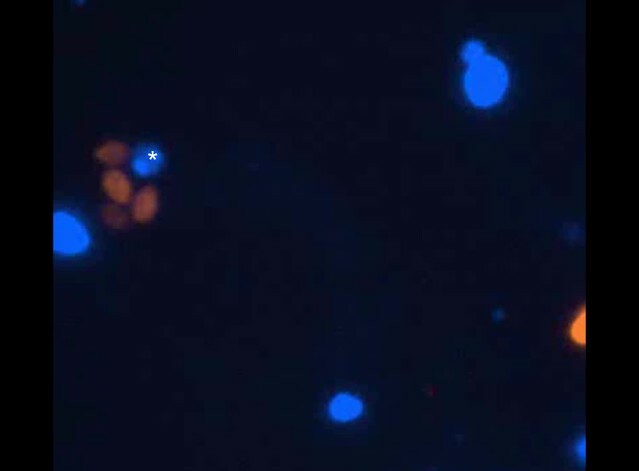 Note the dye-retaining amastigote (blue) remaining undivided while other amastigotes in the same cells (bright orange amastigotes) actively proliferate. Time lapse video of early stage intracellular replication of T. cruziamastigotes. Cultures of Vero cells in 96 well glass bottom plates were infected with Tdtomato-expressing CellTrace Violet labeled trypomastigotes in a ratio of 5:1 (parasites: host cells). After a5hrincubation, cultures were washed to remove extracellular parasites and imaged every 15 min for 48hr. Time lapse videos were generated spanning from 9:30 to 47:15hr. 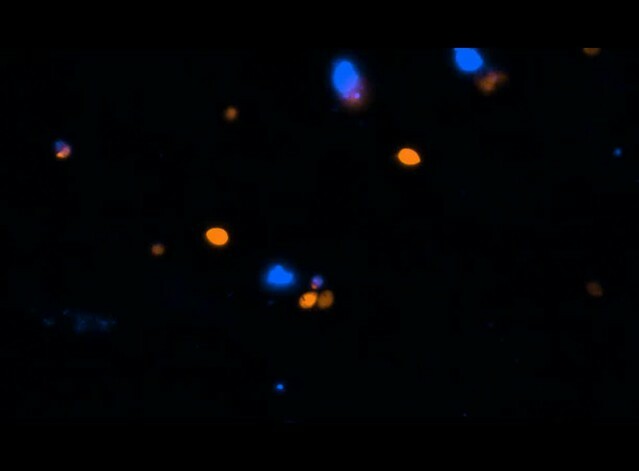 Note the dye-retaining amastigote (blue amastigote denoted by white asterisk at the beginning of Video 1) remaining undivided while other amastigotes in the same cell (bright orange amastigotes) actively proliferate. These results show conclusively that within host cells infected with T. cruzi, a subset of amastigotes cease replication while others continue rapid division, eventually filling the host cell with amastigotes. The obvious question remaining is ‘Does this cessation of replication play a critical role in the failure of drugs to effectively clear T. cruzi infection?’ More specifically, are these replication-arrested parasites resistant to drug treatment? To directly address these questions, we infected mice with Tdtomato-expressing and CellTrace Violet-stained trypomastigotes and confirmed 2 days post-infection the presence in adipose tissue of parasites displaying both of these markers (Figure 6A and B). As expected based on previous experiments, over the span of the 2 day infection, several strongly violet-positive parasites are obvious in cells along with a larger number of parasites in which the violet dye was faint or not detectable, indicating both slow or non-replicating and actively replicating progeny of the infecting trypomastigotes. On days 2 and 3, similarly infected mice were treated with BZN or left untreated and on day 4, examined for the presence of parasites. Remarkably, in the BZN-treated mice, the only parasites detected were brightly violet and present at 1 and occasionally two per infected cell (Figure 6B and Figure 6—figure supplement 1). Actively replicating parasites (violet-negative) were not detected in the BZN-treated mice while a much larger number of violet-negative and less abundant violet-positive parasites were observed in the non-treated mice. A resumption of parasite replication was evident in treated mice 9 days after the last of the 2 BNZ treatment doses, demonstrating that dormant, and therefore drug resistant amastigotes, could also resume division in vivo. To further address the drug resistance and recovery potential of dormant amastigotes in vivo, we repeated these experiments in interferon-gamma deficient mice, which lack the ability to develop immune control of T. cruzi infection. 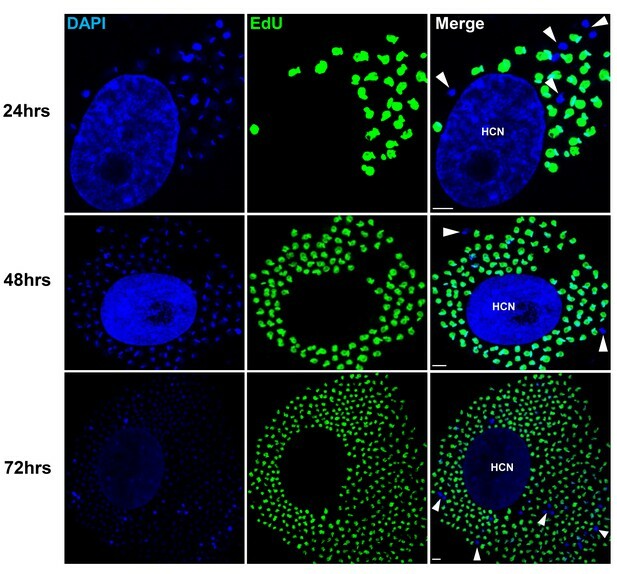 Non-replicating amastigotes developing in these mice survive a minimum of 20 days of BZN treatment (Figure 6—figure supplement 2A) and again resume replication upon cessation of BZN treatment (Figure 6C) and eventually spread extensively in these animals (Figure 6—figure supplement 2B,C). Only dormant amastigotes are resistant to short-term in vivo BZN treatment. (A) Schematic of experimental protocol. (B) C57BL/6 mice were infected i.p. with 5 × 106 Td-Tomato-expressing and CellTrace Violet-labeled trypomastigotes and orally treated with BZN (100 mg/kg/day) on day 2 and 3 post-infection or left untreated. At the indicated time points, mice were euthanized and adipose tissue was excised, fixed and processed for confocal imaging. Images are representative of three independent experiments with 3–4 animals per group. (C) Infection with 1.5 × 107 Td-Tomato-expressing and CellTrace Violet-labeled trypomastigotes was established for 6 days in IFN-g deficient mice before initiation of daily treatment with BZN (100 mg/kg) for 12 days. Peritoneal adipose tissue was harvested from mice on day 6 (prior to treatment), at the end of the 12 day treatment period on day 18 post-infection, or 14 days after the end of treatment (32 dpi). The peritoneal adipose tissue sample from each mouse is ~0.3 g of tissue spread over a surface of ~1.6 cm2 when mounted for microscopic analysis. In tissue harvested on day 6 of infection (prior to treatment), infected cells can be observed within 15 min of scanning. Following 12 days of treatment this same amount of tissue must be exhaustively scanned for up to 3 hr per sample to detect between 4 and 5 infected cells per sample. Images are representative of two independent experiments with four animals each. Tracking very low numbers of persisting parasites in vivo in drug-treated, infected animals is quite difficult, so we returned to in vitro systems to examine the resistance of T. cruzi to drug treatment over longer time periods and the association between drug resistance and dormancy. Here we infected host cells 24 hr previously with Tdtomato-expressing and CellTrace Violet-labeled parasites and then added BZN at 10X the IC50 for up to 30 days of culture before washing out the drug. Parasite recovery following drug treatment/washout was monitored globally by whole-well fluorescence detection of the Tdtomato reporter, and at the individual cell level by microscopy (Figure 7). In the absence of treatment, parasite numbers peak near the time of the completion of the first round of intracellular replication (~day four after infection). In all cases, even following 30 days of high dose BZN treatment, parasites can rebound and begin replication after BZN is removed. This rebound can often be observed in the whole well Tdtomato fluorescence readings (Figure 7A), and in all cases, low numbers of parasites with a range of violet dye retention are evident in cultures during drug treatment (Figure 7B), as well as resumption of low level to vigorous replication after drug washout (Figure 7C). The resistance of T. cruzi to drug treatment due to amastigote dormancy was not restricted only to BNZ, as members of a class of newly developed oxaborale compounds currently under preclinical development also failed to overcome dormancy-dependent resistance in vitro (Figure 7—figure supplement 1). Further, T. cruzi lines rebounding after 30 days of in vitro exposure to BZN had not developed stable resistance to the compound as the IC50 of BZN on this population remained unchanged from that of the pre-exposed population (Figure 7—figure supplement 2). Dormant amastigotes are resistant to extended BNZ treatment in vitro. Vero cell cultures were infected with Tdtomato-expressing trypomastigotes of colombiana or CL strains (5:1 ratio parasites:cells) 24 hr prior to addition of BNZ (10 uM). 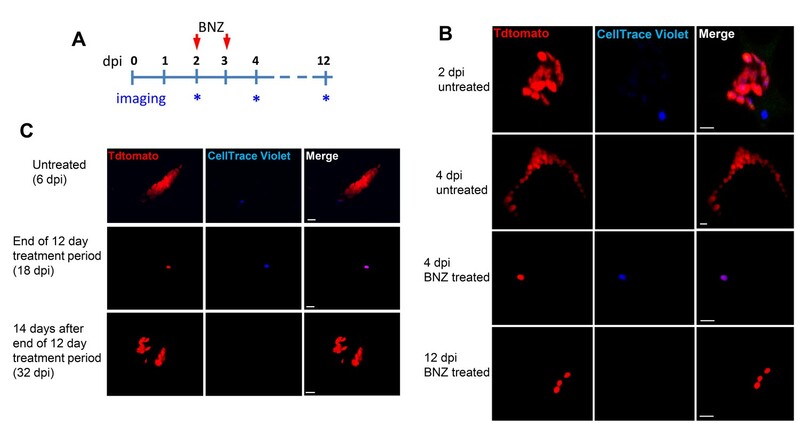 At various times post-treatment, BNZ was removed from the cultures and the subsequent rebound of parasites surviving the drug treatment was determined by whole well fluorescence intensity reading (A) and in vitro live imaging (B, C). The retention of the CellTrace Violet label during the course of BNZ treatment indicates that the BNZ-resistant parasites are dormant (B) and capable of replication after drug washout (C). Results are representative of three independent experiments with six replicates per condition. Arrow to inset in (A) shows reading of individual replicate wells. Thus, T. cruzi amastigotes regularly and spontaneously cease replication and in that dormant state are resistant to otherwise highly effective trypanocidal drugs for extended periods of time. These dormant parasites are capable of re-initiating replication after >30 days of drug exposure and perhaps much longer after the initiation of dormancy. Although T. cruzi infection is one of the highest impact infectious disease in the Americas, including in the United States, effective prevention, control and treatment methods are virtually non-existent. A rare bright spot in potential interventions for Chagas disease is the increased availability of drugs such as BZN, which have substantial curative efficacy. However, although BZN and NFX have been in use for decades, have relatively clear mechanisms of action and do not appear to readily encourage development of genetic-based drug resistance, their unpredictable treatment outcome coupled with their modest to severe side effects has limited their use primarily to acute, childhood, or immunosuppression-exacerbated infections. This situation leaves largely untreated the millions of individuals with chronic T. cruzi infection, many of whom will eventually develop chagasic cardiomyopathies. Furthermore, human clinical trials of new therapies judged to be promising based upon limited studies in experimental models have been colossal failures (Molina et al., 2014; STOP-CHAGAS Investigators et al., 2017) and ClinicalTrials.gov identifiers NCT01489228, NCT02498782, and NCT01162967), demonstrating these compounds to be clearly inferior to BNZ and NFX. This study initially sought to determine why compounds like BZN that can, and often do, provide sterile cure in T. cruzi infection, also frequently fail. This and previous studies have largely ruled out several mechanisms as primary reasons for the variable efficacy of BZN. Although there is parasite strain variation with respect to BZN susceptibility in vivo, this variation does not appear to be due to direct resistance to the trypanocidal activity of BZN (Figure 1). Parasite lines obtained from failed drug treatments are no more resistant to BZN than the pre-treatment parasites (Sup Figure 7), and although BZN resistance can be induced by drug selection in vitro, such partially resistant lines are crippled with respect to initiating and maintaining an infection (Mejia et al., 2012). Thus resistance to BZN treatment is relative, not complete, is not easily selectable, and is not associated with any specific genetic lineage of T. cruzi nor with host genetics. The results of the current study firmly connect drug treatment failure in T. cruzi infection to the presence of a previously unrecognized player in this parasite’s life cycle, the transiently dormant amastigote. We denote these stages as dormant based primarily on their failure to replicate over an extended period of time and their resistance to trypanocidal compounds over >30 days of exposure. These dormant amastigotes appear at a consistently detectable frequency and are present in many infected host cells in vitro and in vivo. Dormancy occurs spontaneously and is often observed soon after host cell infection – as shown by the ability of parasites to retain cell division monitoring dyes through several rounds of host cell invasion and expansion. However dormancy may also occur at other points throughout the 4–5 day replication cycle within host cells, as suggested by the presence of multiple EdU-negative amastigotes in heavily infected cells and supported by time lapse imaging of infected cells. Importantly, these dormant parasites are not permanently arrested, as they resume replication days to weeks after entering dormancy (Figure 7). These dormant amastigotes also readily respond to the cues that drive conversion to trypomastigote forms within host cells, a process that appears to occur only when the host cell is nearly bursting with amastigotes. Candidates for the inducer of stage conversion would include depleted host cytoplasmic components or byproducts of parasite metabolism that could accumulate inside the host cell. Thus the dormant amastigotes have two potential fates besides continued dormancy: to re-initiate replication like conventional amastigotes – likely to occur when there are none or a limited number of other amastigotes in the cell - or to convert to trypomastigotes in concert with the actively replicating amastigotes undergoing that process within the same cells. An extremely rare outcome for amastigotes in host cells is death, as determined by the paucity of degrading amastigotes detected in host cells (Sup Figure 3). Dormancy is well-studied in bacteria and plays a critical role in their adaptation to changing environments. This phenomenon had been missed by previous investigations in T. cruzi likely because extended dormancy (which would be required to survive during weeks of drug treatment) is relatively rare. In vitro studies often report very high efficiency of drugs such as BZN to kill >99% of T. cruzi amastigotes – and the assumption has been that this was in fact 100% killing (Moraes et al., 2014), but this is clearly not the case. To our knowledge, this is the first report of extended dormancy in an otherwise replicating stage of any trypanosomatid. In the related protozoan Leishmania sp, intracellular amastigotes exhibit greatly reduced proliferation and metabolism relative to the extracellular promastigote forms (Jara et al., 2017) and have been described as ‘semi-quiescent’ but steadily replicating in vivo with a doubling time of 12 days for L. mexicana (Kloehn et al., 2015). Studies in L. major by Mandell and Beverley documented slow growing (~60 hr doubling time) and even slower dividing, BrdU-non-incorporating intracellular amastigotes in mouse infections but the technical limitations of the labeling procedure prevented a definitive conclusion of dormancy (Mandell and Beverley, 2017). The dormancy we describe here for T. cruzi is clearly very distinct from but perhaps most similar to the scantly studied arrested hypnozoite liver stages of Plasmodium vivax. Hypnozoites appear responsible for relapse of vivax malaria even years after the initial infection (Markus, 2012), although studies in human liver chimeric mice suggest that hypnozoites may actually not be fully metabolically inactive (Mikolajczak et al., 2015). Cyst stages of apicomplexans such as Toxoplasma gondii and Cryptosporidium sp exhibit greatly reduced if not fully quiescent metabolism, consistent with a life cycle stage that is resistant to potentially harsh environmental conditions associated with transmission to a new host. For T. cruzi it is much less clear what the evolutionary advantage of dormancy is since transmission depends on putting extracellular parasites into the mammalian host bloodstream for ingestion by its blood feeding reduviid vector. Although we show that dormancy provides a degree of protection from drug-mediated clearance, drug resistance itself cannot be the selective force for this developmental pathway as all the T. cruzi lines we have examined, including ones that had not been previously exposed to these or other drugs, generate dormant amastigotes. If dormancy is programmed and essential for T. cruzi survival, then the property would seem most likely associated with evasion of host immune responses, the major stressor with which T. cruzi amastigotes have to contend. T. cruzi induces a robust and highly effective immune response that greatly reduces parasite transmission to insect vectors. Although it is relatively rare, this immune response can lead to complete resolution of the infection (Dias et al., 2008; Tarleton, 2013; Viotti et al., 2006). Dormancy could facilitate parasite persistence if some trypomastigotes entering host cells immediately went quiescent and as a result were not detected by the immune system. Such persisters could then ‘wake-up’ and begin replication weeks or months later. But those reawakened parasites would likely remain low in numbers as they would have to contend with the now established anti-T. cruzi immune response in order to expand and have an increased chance of being transmitted. Thus the selective pressure for development or retention of a dormancy pathway for this purpose alone seems very low. Alternatively, dormancy might be a consequence of the biology of T. cruzi, rather than an evolutionarily selected process for low-level persistence. T. cruzi very rarely undergoes sexual recombination but instead depends heavily on gene amplification and recombination, as well as horizontal gene transfer, for generating genetic diversity. The resorting of genetic material likely takes place in amastigotes, one of the two replicating stages in the T. cruzi life cycle. Parasites that enter dormancy soon after host cell invasion could be pre-recombination, ‘stem-like’ cells that would be useful should the genetic recombination events in the replicating parasites go awry. Alternatively, parasites might enter dormancy in order to sort out the result of recombination events before proceeding with additional rounds of replication. Whether stochastic or programmed, the mechanisms for entering and exiting the dormant state by T. cruzi is a complete black box. Hints about the process may come from understanding the events involved in transitioning from replicating stages to non-replicating stages in T. cruzi (e.g. epimastigotes to infective metacyclic trypomastigote and amastigote to blood stage trypomastigote) or in the related African trypanosome Trypanosoma brucei, which although lacking an intracellular stage, makes several well-characterized transitions from replicating to non-replicating forms. The biggest practical message from the current study is that dormancy in the mammalian infection cycle of T. cruzi is key to the failure of current drug treatments for T. cruzi infection. While other factors, including the differential tissue tropism of parasite strains and tissue distribution of potential drugs, certainly also impact treatment outcomes, only dormancy has been definitively linked. Given this new understanding of dormancy and its impact on drug treatment, simply identifying more compounds that effectively kill metabolically active parasites is not likely on its own to be the solution to achieving more dependable cure in T. cruzi infection. The development of new assays that can screen for compounds capable of overcoming dormancy should also be part of the paradigm for identifying new, more effective compounds. The use of current drugs in extended, less intensive dosing routines (Álvarez et al., 2016; Bustamante et al., 2014) that extend beyond the dormancy potential of T. cruzi, in place of the current highly intensive regimens, should also be further explored. Strain, strain background (Trypanosma cruzi, colombiana) TdTomato and luciferase coexpresors; Luciferase- and Tdtomato-expressing parasites. this paper NA Cotransfected with pTREX-Luciferase and pTREX-Td-tomato plasmids. Strain, strain background (T. cruzi, colombiana) Colombiana strains expresing luciferase this paper NA Transfected with the pTREX-Luciferase plasmid. Strain, strain background (T. cruzi, CL3) CL-3 strain expresing luciferase this paper NA Transfected with the pTREX-Luciferase plasmid. Strain, strain background (T. cruzi, ARC0704) ARC-0704 strain expresing luciferase. this paper NA Transfected with the pTREX-Luciferase plasmid. Strain, strain background (T. cruzi, colombiana) TdTomato expresing parasites. this paper NA Transfected with pTREX-Tdtomato plasmid. SKH-1 mice other NA The SKH-1 ‘hairless’ mice backcrossed to C57BL/6 were a gift from Dr. Lisa DeLouise (University of Rochester). C57BL/6NCr and IFN-γ knockout (B6.129S7-Ifngtm1Ts/J) mice were purchased from Charles River Laboratories and The Jackson Laboratory respectively. The SKH-1 ‘hairless’ mice backcrossed to C57BL/6 were a gift from Dr. Lisa DeLouise (University of Rochester). All mice were maintained in the University of Georgia Animal Facility under specific pathogen-free conditions. This study was carried out in strict accordance with the Public Health Service Policy on Humane Care and Use of Laboratory Animals and Association for Assessment and Accreditation of Laboratory Animal Care accreditation guidelines. The protocol was approved by the University of Georgia Institutional Animal Care and Use Committee. To generate bioluminescent parasites, CL-3, ARC-0704 and Colombiana T. cruzi strains were transfected with the pTREX-Luciferase-Neo plasmid, generated by cloning of the firefly luciferase gene from the Luciferase-pcDNA3 plasmid (gift from William Kaelin; Addgene plasmid # 18964) into the multi-cloning site of the pTREX plasmid (Vazquez and Levin, 1999). 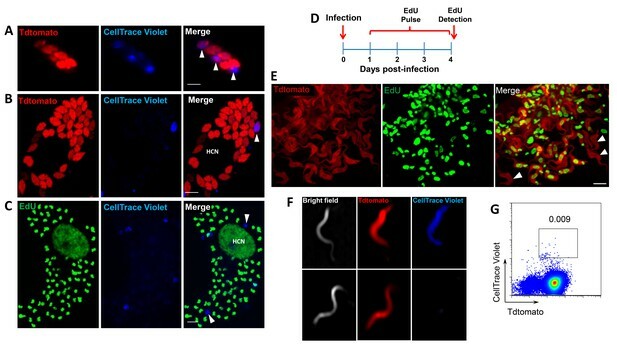 Colombiana bioluminescent parasites were transfected with pTREX-Td-tomato plasmid (Canavaci et al., 2010) to generate parasites co-expressing bioluminescent and fluorescent markers. Transfection and selection conditions were as previously described (Peng et al., 2014). For single-cell cloning, parasites were deposited into a 96-well plate to a density of 1 cell/well using a MoFlow XDP (Beckman Coulter, Hialeah, FL) cell sorter and cultured in 250 μl LDNT supplemented with 300 mg/ml G418. Selected clones were screened for luciferase activity as previously described (Lewis et al., 2014) and a highly luciferase-expressing clone was selected for in vivo experiments. To obtain metacyclic forms, epimastigotes were submitted to stress in triatome artificial urine (TAU) medium for 2 hr. Then, parasites were incubated in complemented TAU medium (TAU3AAG))(Bourguignon et al., 1998) for 6–7 days, at which time transformation to metacyclic trypomastigote was maximal. Vero cells were obtained from the American Type Culture Collection (Manassas, VA) and cultured in RPMI 1640 medium with 10% fetal bovine serum. Human foreskin fibroblast (HFF) cells were a gift from Dr. Drew Etheridge (University of Georgia) and were maintained in DMEM media supplemented with 10% fetal bovine serum. Cultures were maintained in a humid atmosphere containing 5% CO2 at 37°C and tested periodically for mycoplasma contamination. Luciferase- and Tdtomato-expressing parasites were used to assess in vivo parasite replication and clearance in mice. For bioluminescent detection, mice were injected via an intraperitoneal (i.p.) route with D-luciferin (150 mg/kg; PerkinElmer, Waltham, MA) and anesthetized using 2.5% (vol/vol) gaseous isofluorane in oxygen prior to imaging on an IVIS 100 imager (Xenogen, Alameda, CA) as previously described (Canavaci et al., 2010). Quantification of bioluminescence and data analysis was performed using Living Image v4.3 software (Xenogen). EdU incorporation into amastigote DNA was detected using the Click-iT EdU Imaging Kit (ThermoFisher Scientific, Waltham, MA) following manufacturer specifications. Briefly, Vero cells (1 × 105 cells) were plated onto sterile glass-bottom 35 mm petri dishes and incubated overnight ON at 37°C, 5% CO2, in RPMI-1640 medium plus 10% fresh fetal bovine serum (FBS). Trypomastigotes of the colombiana, CL, Brazil or ARC-0704 strains were used to infect dishes at a ratio of 10 parasites to one host cell. After ON infection, cell cultures were washed with RPMI and incubated with 100 µM EdU for 24, 48 or 72 hr prior to fixation, staining and mounting in ProLong Diamond anti-fade mounting solution (ThermoFisher Scientific, Waltham, MA) containing 4’,6-diamidino-2-phenylindole dihydrochloride (DAPI) to stain nuclear and kinetoplast DNA. Images were acquired using a laser scanning confocal microscope LSM 710 attached to an EXFO Xcite series 120Q lamp and a digital Zeiss XM10 camera. C57BL/6 mice were infected with 2.5 × 105 colombiana T. cruzi strain trypomastigotes co-expressing fluorescent (Tdtomato) and luminescent (luciferase) proteins. Sixty days post-infection, mice were injected i.p. with 10 mM EdU and sacrificed 12, 48 or 72 hr later. Before bioluminescence imaging, mice were transcardially perfused with 1x PBS and then with D-luciferin (0.3 mg/ml) diluted in 1x PBS. Tissue-specific ex vivo luciferase imaging was performed with tissues soaked in D-luciferin (0.3 mg/ml). Luciferase positive thick tissue sections were excised and consecutive imaging and sectioning were performed to reduce non-luminescent area and increase chances to localize amastigote infected tissues. Selected tissue sections were washed in 1x PBS and fixed with cold 4% PFA. After 4°C ON fixation, tissues were washed with 1x PBS and immersed in CUBIC clarifying solution (Susaki et al., 2015) (25 % N,N,N′,N′-Tetrakis (2-hydroxypropyl) ethylenediamine; 25% urea; 15% Triton X-100 and distilled water) with shaking at 37°C during 2 days. After clarification, EdU incorporation on intracellular amastigotes was detected as previously described. 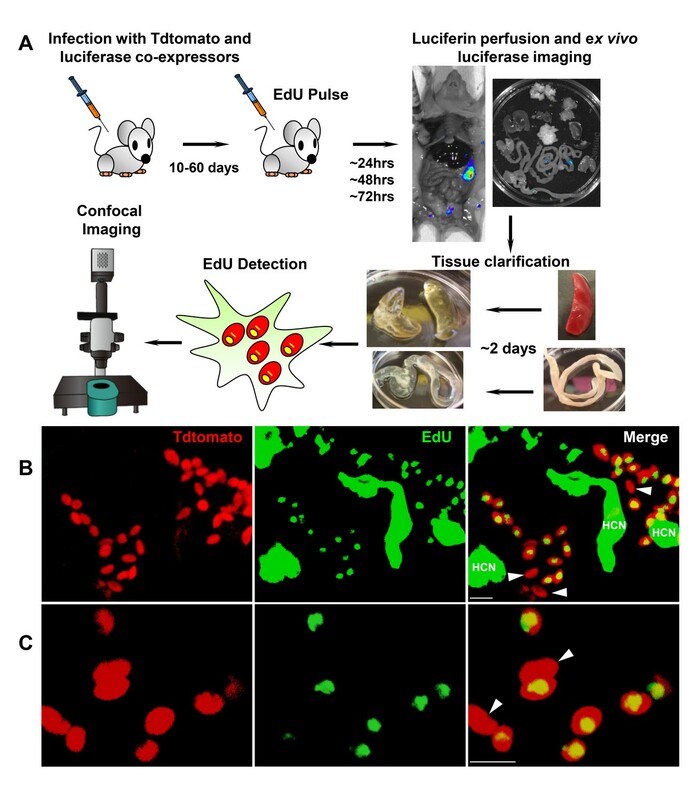 For selection of parasite-containing tissue areas for further imaging in non-drug treated mice, luciferase-positive thick tissue sections were excised and consecutive imaging and sectioning were performed to obtain small tissue sections with the brightest luminescent foci. Tissue sections were fixed and clarified as described above, and EdU incorporation on intracellular amastigotes was detected by click chemistry as described above. Tissue sections were placed into sterile glass-bottom 35 mm petri dishes, mounted using ProLong Diamond anti-fade solution and prepared for confocal imaging using a Zeiss LSM 710 attached to an EXFO Xcite series 120Q lamp and a digital Zeiss XM10 camera. In the case of abdominal adipose tissue from drug-treated mice, wherein parasites were extremely scarce, both unfixed and PFA-fixed, non-clarified tissues were scanned for parasites using a 40X objective. DNA fragmentation indicative of parasite death was assessed by TUNEL (Terminal deoxynucleotidyl transferase-mediated dUTP Nick End Labeling) assay according to manufacturer's protocol (Click-iT TUNEL Alexa Fluor 647 imaging assay; ThermoFisher Scientific, Waltham, MA). Briefly, Vero cells (1 × 105) were infected with 1 × 106 colombiana strain trypomastigotes for approximately 12 hr. Seventy-two hours post-infection, cells were washed twice in PBS, fixed with 4% PFA and then washed again in PBS. After permeabilization with 0.2% Triton X-100, the cells were incubated with TdT reaction cocktail and washed twice with 3% BSA. Finally, cells were incubated with click-iT reaction buffer and washed with 3% BSA. Parasites were pre-treated for 10 min at room temperature with 10 IU/mL DNase I prior to the TUNEL for positive control. A negative control was performed in the absence of the terminal transferase. Cells were mounted using ProLong Diamond anti-fade mounting solution containing DAPI for parasite nuclei visualization. Results were quantified counting about 200 cells in duplicate from three independent experiments. Cell suspensions of T. cruzi trypomastigotes were labelled with CellTrace Violet fluorescent dye (CellTrace Cell Proliferation Kit, ThermoFisher Scientific, Waltham, MA) and CFSE following manufacturer’s instructions. Briefly, 2 × 106 trypomastigotes were incubated for 20 min at 37°C with 10 μM of CellTrace Violet or for 5 min with 5 μM of CFSE, protected from light. Unbound dye was quenched by the addition of five volumes of 10% FBS-RPMI or one volume of FBS respectively. After washing in fresh media parasites were used for infection of cell cultures or mice. Human foreskin fibroblasts (HFF) or Vero cells were seeded in 96 well glass bottom plates (Corning Life Sciences, NY) or 8 well 1 µ-slides (Ibidi, Fitchburg, WI) and infected with Tdtomato-expressing colombiana or CL strain parasites labeled with CellTrace Violet in ratios of 2:1 to 10:1 (parasites:host cells). For time-lapse video of amastigote replication, extracellular trypomastigotes were removed by washing and plates were placed in humid chamber with CO2 and imaged at 40X magnification every 15 min for 48 hr in a Lionheart FX imager (BioTek, Winooski, VT). Images and time lapse videos were analyzed with the Gene5 software (BioTek). Live cell imaging of cultures at different times post-infection and after drug addition or removal were performed in a Cytation5 cell imager (BioTek) or a Delta Vision II Microscope System (GE Healthcare Biosciences, PA). Vero cell cultures were infected with CellTrace Violet-labeled Tdtomato-expressing parasites of colombiana or CL strain (5:1 ratio parasites:host cells) and incubated for 6 days at 37C in 5% CO2. Free trypomastigotes released to the supernatant were harvested and imaged using an ImageStream Mark II (MilliporeSigma, MA). CellTrace Violet- Tdtomato- positive parasites from those supernatants were sorted using a MoFlo XDP (Beckman Coulter, FL) and placed in fresh Vero cell cultures that were periodically monitored and imaged using a Cytation five imager (BioTek). Gamma-irradiated Vero cells at 25,000/well were infected with 150,000 colombiana or CL strain Tdtomato-luciferase trypomastigotes in each well of a 96 well plate (Greiner Bio-one) for 24 hr. After removing non-infecting trypomastigotes, 10 μM BZN (approx. 10X IC50) in complete RPMI media was added. The six replicate wells for each condition were read using BioTek Synergy Hybrid reader and images were taken by BioTek Cytation 5. At the indicated times post-treatment, BZN was removed, cultures washed and fresh medium without BZN added. Spent medium was removed and fresh medium with or without BZN were added weekly. Additional (15,000/well) Vero cells were added biweekly. The relative in vitro resistance to drug treatment by T. cruzi lines was determined as previously described (Canavaci et al., 2010), and IC50 was calculated using the GraphPad PRISM 5.0 software. The Mann-Whitney U tests and one-way variance analysis (ANOVA) of the GraphPad Prism version 5.0 software were used. Values ​​are expressed as means ± standard error of mean of at least three separate experiments. P values equal to or minor that 0.05 were considered significant. Antimicrobial Agents and Chemotherapy 60:833–837. Histochemistry and Cell Biology 110:527–534. Journal of Infectious Diseases 209:150–162. PLoS Neglected Tropical Diseases 4:e740. Revista da Sociedade Brasileira de Medicina Tropical 41:505–506. Expert Review of Anti-infective Therapy 9:609–620. The Journal of Infectious Diseases 206:220–228. Cell Host & Microbe 17:526–535. New England Journal of Medicine 370:1899–1908. Journal of the American College of Cardiology 69:939–947. The American Journal of Tropical Medicine and Hygiene 87:489–490. Chagas disease: a role for autoimmunity? Revista Española De Salud Pública 87:33–39. PLoS Neglected Tropical Diseases 5:e1314. Annals of Internal Medicine 144:724–734. PLoS Neglected Tropical Diseases 3:e488. Thank you for submitting your article "Spontaneous dormancy protects Trypanosoma cruzi during extended drug exposure" for consideration by eLife. Your article has been reviewed by 3 peer reviewers, and the evaluation has been overseen by a Reviewing Editor and Wendy Garrett as the Senior Editor. The following individuals involved in review of your submission have agreed to reveal their identity: John M Kelly and David Sacks. In this study, the authors provide sound evidence that Trypanosoma cruzi can be found in a dormant/latent state both in vitro and in vivo experimental models. Using CellTRace Violet to track and isolate the few non-dividing parasites from infected cells in vitro, the authors were able to show that the dormant/quiescent parasites can establish a second round of infection in new host cells. They also provided good in vivo evidence that the non-dividing parasites persist following treatment with benzinidazole and are capable of re-initiating an infection. The data presented are novel and will be of much interest to those involved in finding curative treatments for this important neglected tropical infection. Indeed, the existence of non-replicating amastigotes is an important discovery that might explain the widely observed treatment failure as outcome of Chagas disease therapy and the poor efficacy of some compounds despite their promising curing properties. Although no data on the mechanisms of this process are reported, the results are of significant value, and will no doubt stimulate much downstream research to unravel the mechanism(s), determine the biological role, and understand the consequences for drug development. 1) The in vitro infections shown in Figure 3 and 4 could have been exploited to provide more quantitative data regarding the proportion of non-dividing cells that arise within each generation, and to estimate if this frequency changes during successive generations as the numbers of intracellular amastigotes increases. It would also have been informative to more carefully quantify for comparison the subsequent infections initiated by the CellTrace Violet-positive and negative trypomastigote populations for their intracellular growth and the frequency of non-dividing forms that they give rise to. The limited data provided in Figure 5 shows a single Vero cell with a massive infection initiated by the CellTrace Violet-positive population. Only a single non-dividing parasite is indicated, which seems quite low compared to the frequencies observed in Figures 3 and 4. The experiments shown in Figure 6 and Figure 6—figure supplements 1 and 2 are the key results of the paper but are difficult to assess. The results are meant to indicate that only non-dividing parasites remain after drug treatment, and that these parasites can reinitiate a productive infection. What is actually shown in Figure 6 from the tissue of 3-4 mice treated mice, however, is a single non-dividing parasite. It is not at all clear what this 'representative' result refers to. How many cells, or how much tissue was examined? Were there absolutely no Td-tomato staining cells that were CellTrace Violet-negative? Even a few may have contributed to the re-established infection. Is there some way to quantify this data, by flow cytometry perhaps? It would be especially informative to compare the number of the 'dormant' parasites in the adipose tissue (and/or other tissue) in groups of infected mice before and after treatment. Several fluorescence microscopy images are of poor quality, pixelated (e.g. Figure 3 24 hrs and 72 hr. Figure 4B, Figure 6B), saturated (e.g. Figure 2B, C; Figure 3 24 hrs and 72 hrs; Figure 2—figure supplements 1 and 2), out of focus (e.g. Figure 4F; Figure 5A Merge; Figure 5B; Figure 6B, C; Figure 7B); these images cannot be published as presented, considering the importance of the findings. The use of CellTrace Violet to identify the dormant amastigotes is quite clever but some images of these parasites are rather poor (e.g. Figure 7B). By contrast, Figure 4E is of very good quality. Figure 4F, G: it would be nice to have images of samples from the other representative fractions of the cellTrace/Tc-Tomato plot. No direct proof is presented since few resistant parasites (although rare) could give rise to the fluorescence peaks. Also, the authors should perform double staining with Tunel/EdU to confirm that dormant parasites are not dying. Biochemical evidence of the dormant amastigotes is lacking: can their ATP consumption be measured? Or the activity of critical metabolic enzyme(s)? Would it be possible to generate parasites transfected with fluorescence reporters for these components in order to directly monitor dormancy in vitro and in vivo? How do the authors distinguish dormancy from slow growth/long generation times? The reviewers ask interesting questions, but for the most part, they are not approachable with the current technology. For example, with neither the CellTrace Violet nor with EdU is it possible to assess if parasites stop dividing at later points (rounds) during infection in a host cell (i.e. once CellTrace Violet is diluted due to replication, it is difficult to observe cessation of replication without monitoring individual parasites by time lapse). We have done such time lapse monitoring of a limited number of host cells and have not yet observed amastigotes that were actively dividing, stop dividing. Further, in the in vivo and in vitro drug treatment/washout experiments, all parasites that are detected are CellTrace Violet-positive – and thus would have had to have arrested early in the replication cycle within host cells. Thus, we conclude that dormancy occurs preferentially and possibly exclusively soon after host cell invasion and conversion to amastigotes. It would be very challenging to generate highly quantitative frequency data on dormant parasites in different experiments (especially through 2 rounds of cell invasion as shown in Figure 5), under different culture conditions or with different isolates. Our attempts to do so suggest that there is not an increased frequency of dormancy in particular strains. With specific reference to the comment comparing the frequency of dormant parasites in host cells in Figures 3 and 4 compared to Figure 5, multiple trypomastigotes may enter the same host cell in our standard in vitro assays (where the standard parasite:host cell ratio is 10:1) while this is very highly unlikely in the experiment shown in Figure 5 where a very limited number of parasites were used to infect monolayers of host cells. The images we have selected for inclusion in this manuscript accurately reflect the fact that while dormancy occurs routinely, it is not uniform in every infected cell, hence our conclusion that it is not highly programmed. We agree that the experiments in Figure 6 and Figure 6—figure supplement 1 and 2 are among the key results in the paper – although not the only ones. For these experiments, the peritoneal adipose tissue sample from each mouse is ~0.3 g of tissue spread over a surface of ~ 1.6 cm2 when mounted for microscopic analysis. In tissue harvested on day 6 of infection (prior to treatment), detection of infected cells is relatively easy and 3-4 infected cells can be observed within 15 minutes of scanning. Based on the observation of approximately 30 infected cells containing a total of 140 amastigotes, we estimate the frequency of Violet+ amastigotes among all amastigotes at this point is ~ 2%. Following 12 days of treatment this same amount of tissue must be exhaustively scanned for up to 3 hrs per sample to detect between 4 and 5 infected cells per sample. Every one of these infected cells contained only violet-positive parasite, generally only 1 parasite per cell. Scanning tissues from more than 12 mice using this process never revealed a violet-negative parasite during or at the conclusion of treatment. Figure 6 does indeed show a single dormant parasite – but the purpose of the supplementary figures is to indicate that this was not the only one found – collectively we have found dozens but did not feel that it was necessary to show them all. It is impossible to prove that there is not a non-dormant parasite in mice or animals after 20-30 days of drug treatment – but we have not ever observed them while we do, albeit with great effort, observe non-replicating parasites. Some of this additional description has been added to the figure legends to indicate the vigor with which we searched for dormant and non-dormant parasites. We do not believe that it will be especially informative to quantify dormant parasites before and after treatment in large part because the timing of “awakening” from dormancy is clearly variable. We know that brief BZN treatment of animals or cell cultures results in higher detectable levels of violet+ dormant parasites than longer-term treatment, suggesting that dormant parasites can exit dormancy while under drug treatment and as a result, be killed. One could argue that BZN is slowly killing parasites while they are dormant but then one would have to explain how some dormant parasites can resist BZN killing for 30 days or more. Estimating the number of dormant parasites in the tissue by flow cytometry is quite difficult due to the scarcity of parasites surviving the BZN treatment and the process of the tissue necessary for flow cytometry (requiring enzymatic digestion, etc.). We unsuccessfully tried this approach originally with skeletal muscle of animals chronically infected with Td-tomato expressing parasites and moved to the microscopic analysis of adipose tissue with better results. Several fluorescence microscopy images are of poor quality, pixelated (e.g. Figure 4B, Figure 6B), saturated (e.g. Figure 2B, C; Figure 3 24 hrs and 72 hrs; Figure 2—figure supplements 1 and 2), out of focus (e.g. Figure 4F; Figure 5A Merge; Figure 5B; Figure 6B, C; Figure 7B); these images cannot be published as presented, considering the importance of the findings. The use of Cell Trace Violet to identify the dormant amastigotes is quite clever but some images of these parasites are rather poor (e.g. Figure 7B). By contrast, Figure 4E is of very good quality. Figure 4F, G: it would be nice to have images of samples from the other representative fractions of the cellTrace/Tc-Tomato plot. Overall quality of the images has been improved. An ImageStream example of Td-tomato positive- violet-negative parasite for Figure 4F is shown and sharper images selected for ImageStream figures. Images from live cultures using the Cytation 5 or from thick adipose tissue samples represent a challenge and usually those techniques have inherent limitations that prevent obtaining images of the same crispness as for those of monolayers or sections by the confocal microscopy (Figure 4E). We increased the resolution of all the pictures to 300dpi. In Figure 2B and C and Figure 7B the saturation and exposure were decreased as much as possible. In Figure 3, saturation and exposure were decreased in the pictures of 24hrs and 72 hrs. Pixelation and focus was corrected/optimized for Figure 4B, Figure 5Figure 6B and 7C. The image in Figure 6C at 6 days was changed to a picture containing a nest with a violet amastigote. The reviewers suggest a more detailed biochemical and metabolic characterization of the dormant parasites in order to discriminate them from proliferating amastigotes and to demonstrate true dormancy. We agree that this would be nice, but is well beyond this initial report. We have begun such investigations, attempting as suggested to engineer parasites expressing a reporter for ATP levels. However, although such reporters have been successfully used in mammalian cells (Tantama, et al., Nat Commun, 2013; Yaginuma, et al., Sci Rep, 2014), they did not function in T. cruzi, perhaps because ATP levels in the parasites are not within the reporter range of the cytoplasmic ATP sensor. Measuring enzymatic activity would also be useful, but very challenging in these intracellular parasites, where host enzyme activity and substrate availability must also be dealt with. We unsuccessfully attempted a TUNEL/EdU double detection – the two protocols were incompatible in our hands. However, as described in Figure 3—figure supplement 1 the detection of TUNEL positive amastigotes dying inside cells is extremely rare and does not correlate with the proportion of EdU negative or violet-positive parasites detected in similar conditions. Further, we show that previously dormant parasites can convert to trypomastigotes, reinvade new host cells, and resume replication – all properties inconsistent with being dead. Our experiments of infection of fresh cultures with sorted violet-positive parasites (Figure 5) as well as the rebound after drug treatment (Figure 6 and 7) suggest that parasites resistant to drugs under these conditions are not fixed indefinitely in a non-proliferative dormant state but are totally viable and capable of further proliferation. Therefore, it is not unreasonable to think that those parasites could just display a slower replication. Although we have observed in the time lapse experiments different frequency of division in some amastigotes, the lack of EdU incorporation in some parasites exposed to EdU in vitro for over nearly the entire replication cycle inside the cells, suggests that these parasites have not divided (or did so only just following invasion), in clear contrast to amastigotes actively proliferating in the same cell. Parasites that resist BZN treatment for 20-30 days are not stably resistant to BZN in the classical sense- they can be killed as easily as parasites never exposed to BZN once they become metabolically active Figure 7—figure supplement 7). Thus, a few BZN-resistant parasites are not responsible for our observations, unless BZN-resistance is transient – e.g. the parasites are dormant. The difference between very slow growth and dormancy is ultimately semantics – if very slow growth means not dividing for 30 days, then we would agree with that description. But again, this is a transient property – once dormant parasites exit dormancy, they have a “normal” rate of growth. In short, we believe the sum of the data here argue for a state of dormancy. Determining the metabolic and biochemical markers of dormancy will not be easy but it is in our plans. We are grateful to Julie Nelson from the CTEGD Flow cytometry core and Muthugapatti Kandasamy from the Biomedical Microscopy Core as well as the assistance of Dr. Ronald Etheridge in live imaging. This work was supported by US National Institutes of Health grants AI108265 and AI124692 to RLT. Skillful technical assistance was provided by Katherine Kruckow. Animal experimentation: This study was performed in strict accordance with the recommendations in the Guide for the Care and Use of Laboratory Animals of the National Institutes of Health. All of the animals were handled according to approved institutional animal care and use committee (IACUC) protocol A2015 05-010-R3 approved by the University of Georgia Institutional Animal Care and Use Committee under Animal Welfare Assurance #A3437-01. © 2018, Sánchez-Valdéz et al. Daniel M Parker et al. Bernadette C Young et al. Elizabeth A Mueller et al.